DT: Samuel, your previous film Lebanon was shot entirely inside a tank. Needless to say, it was highly claustrophobic. 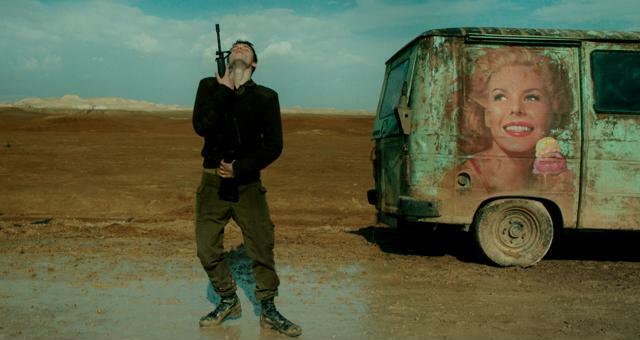 In Foxtrot, much of the film is shot in the desert, yet you managed to create that same feeling of claustrophobia, even though it takes place in the middle of these vast open spaces. How did you do that? SM: We’re looking at one point at the end of the day. Usually in films you go from place to place, with many locations. The fact that with this film you’re stuck in the same point creates that feeling, I think. LA: It’s the same as if you were in the middle of the sea. There’s nothing in the scenery…it’s all the same. You see sand. It’s open wide but without any details. SM: It’s like being isolated. LA: It’s like being on the sun or the moon. This is the claustrophobia. It’s not the same as claustrophobia in a small room, but wherever you look, you see the same, so in a way, there’s nowhere to run. SM: There’s no way out. DT: The film reminded me of Yeats’s poem “The Second Coming:” “Things fall apart/the center does not hold. Mere anarchy is loosed upon the world.” At the end of Foxtrot, I felt like we had arrived at the end of things, like there’s nowhere to go, there’s no possibility of moving forward from here. LA: That’s the focus of what the film is talking about: that’s the foxtrot [dance]. You need someone from the outside to take you by the hand and take you out of this circle that repeats itself. SM: For me the conclusion of the film is that fate cannot be changed, not because it’s divine but because of the nature of the Israeli traumatic man/woman who shaped the nature of the collective, now stuck in trauma. DT: That’s what was so depressing. SM: The truth is that the little step that can save us from the loop of the foxtrot must be done by the leadership. Only not this leadership—they do the opposite. They press on the buttons of the trauma and they do it with slogans that have nothing to do with reality except maybe the emotional memory of the ancient trauma, the old trauma whose instinctual nature is stronger than any instinctual power, is stronger than any reality and logic. They used to say to us, “We are in existential danger.” This is the mother of slogans. When I hear politicians in Israel say “We are a technological superpower, we have the strongest army and a nuclear weapon because we are in existential danger” it’s more or less like saying, I’m young and strong and healthy because I’m sick. Our culture minister, for example, attacked the film without seeing it, before it was released. In her attack she actually confirmed the film’s message, because she pressed on people’s buttons with slogans that bring them to their feet. “Foxtrot is destroying the country,” she said, as if the film was a nuclear weapon that will erase us from the map. In her attack, she once again lifted a mirror to the radical split in Israeli society. DT: What specifically did she object to? SM:In the beginning she said she’s against the film because there’s a scene where the army breaks into a Palestinian home and slaughters the family. A journalist who saw the film at an academy screening told her, “We saw the film and there is no such scene.” The next day, she said, “It’s because of the scene where they bury the car.” When she was told that the scene is about something wider, that it’s allegorical, she said, “The fact that the director ends the film with this scene says that this was his message.” Then they told her, “We saw the film and it doesn’t end with this scene.” Anyway, the struggle is not only for the film itself, it became a struggle for freedom of speech and expression. DT: Actually, that brings me to my next question. Like people, countries suffer psychological wounds from their own history. These wounds become the country’s DNA. DT: In the United States, our psychological wound is slavery. We’ve never gotten over it, and that’s why we can’t heal the racial divide. I’m wondering if in Israel it’s the Holocaust, and whether that’s a wound that will ever go away. LA: Yes. It’s the Holocaust. The leadership usually uses the Holocaust to present us as the victims. I don’t believe I’m a victim, neither does my generation. Maybe our grandparents did. LA: It’s a mixture of things. I’m not acting, actually. It’s not about acting. In Israel you’re surrounded by people who’ve lost dear ones in terror attacks, in the war, so you know them. They have their daily life, everything is OK, but there’s something that’s not quite right. You can’t point to it, you can’t say, Ah, this is it. It’s not about a sad face or depression. We were trying to find out how I could bring it out without doing a sad face, so I thought it could be done physically. I didn’t sleep the two days preceding the shoot. LA: Just to exhaust myself. Now that I tell you that, you can see it, because it’s almost like slow motion. The eyes are falling down, when I’m leaning on the furniture, I needed to lean because I was falling down from exhaustion. SM: Lior didn’t want to tell me because he thought I wouldn’t like it. LA: I was afraid to tell Samuel. SM: I told him I liked it because I really believe that when you need to deal with something emotional or mental, the best way to do it is through something physical. When I was preparing to shoot Lebanon, I thought, How can I explain to an actor what it’s like to be inside a tank and suddenly someone attacks you? I could use my best description and they would say, Yeah, yeah yeah, but they wouldn’t understand anything. So I took each one of them and put them inside a container. It’s 122 degrees, it’s dark, you can’t sit, but after you survive the first five minutes you get over it because the body recognizes emergency conditions and starts to save energy. You start to breathe slowly and you start to feel like you are floating. You’re saving energy, and it’s OK. After half an hour, I had someone beat on the outside of the container with an iron pipe. When the actor came out of the container after 90 minutes, I could see in his eyes that I didn’t need to explain anything, because he understood. I even had an actor who couldn’t shoot a gun. How could I explain that to him? I took him and a prop gun to a friend’s apartment in the center of Tel Aviv. I took the actor to the window, gave him the toy gun, and said, “Put him in the cross hairs and press the trigger.” It’s a toy, a prop, everybody knows it, but the feeling that someone is in your cross hairs… He couldn’t do it, and suddenly [he understood]. DT: The film is based in part on a real-life incident with your daughter. Can you tell us about that, because I think it puts the film in context. SM: My daughter never woke up early enough to get to school on time, so in order for her not to be late, she would ask me to call a taxi. This habit started to cost us quite a bit of money, and it also seemed to me to be bad education, so one morning I got mad and told her, “You will get the bus like everyone else does. If you’re late, you’re late.” There was a big argument, and I was mad, and I told her quite firmly, “You are taking the bus. Now go.” Her bus was line 5, a quite famous line in Tel Aviv. Twenty minutes after she left, I heard on the radio that a terrorist blew himself up on line 5 and that dozens of people had been killed. I tried to call her, of course, but the cellular service had collapsed because of the unexpected load—this was at the beginning of cell phones in Israel. She returned home an hour later. She told us that when she got to the station, she saw the bus, started to run, waved at the driver, but the bus left the station and she took the next bus. That was the worst hour in my life. It was worse than the entire Lebanon war. I asked myself, What can I learn from this experience? and very quickly I understood that I couldn’t learn anything. LA: He could just make a movie. SM: I didn’t want to investigate or explore but to deal with the gap between the things we control and those that are beyond our control. To explore this limbo where we make decisions. We also tried to do a kind of Greek tragedy in which the hero creates his own punishment and fights against anyone who tries to save him. He’s obviously unaware of the outcome that his actions will bring about. This is the difference between a casual coincidence and a spooky coincidence that looks like a plan of fate, because chaos is certain, the punishment corresponds with the sin almost in its exact form, and there is something round and complete in such a dramatic form. DT: It’s a little like film noir, where character is destiny. Let’s talk about the overhead shots and that gorgeous 360 degree pan. Samuel, what do those shots mean to you as a director, and Lior, as an actor, are you aware of the camera’s position? Lior Ashkenazi as Michael and Yehuda Almagor as Avigdor, Michael’s brother. But to do this, you must have an actor who’s aware of the camera, because he needs to do five or six steps very, very slowly, to take his time. I know actors who I could continue to shoot to this day and they still wouldn’t be able to do this shot. I know that Lior can squeeze his soul, he can really feel, but deep inside there is a computer program working in the background that makes him aware of the camera. LA: It was like a dance. SM: I believe in low tech when you create those shots. In Lebanon, where we were on a studio set, I needed to simulate the movement of the tank. They sent the script to Cinecitta in Italy because they have a platform they used to lend to American films for helicopter scenes. They told me, “Listen, we love the script, for you it’s $250,000.” So my production designer went to a junkyard and bought a wagon for $300, because it was simply a matter of balance—two people here, two people there, and two wheels in the middle. Here, in Foxtrot, it’s the DOP that controlled the movement, along with the two grips, one with the crane and one with the dolly. It’s the combination of three people who need to synchronize between themselves and the actor. The actor must depend on them, they can’t rely on him. DT: Lior, are you watching them while the camera is rolling? LA: No. We are just doing it. LA: I need to see what just happened, and then I can be much better, because I know, OK this is the shot, I understand it now, I know the timing, so let’s do it. DT: Is that the way you work all the time? LA: The light, the angle. SM: But I believe this is the best way to learn. If you’re an actor, you need to get used to yourself from all different angles. Tagged Academy Awards, Foxtrot, IDF, Lior Ashkenazi, Ophir Award, Samuel Maoz, Sarah Adler, Silver Lion, Sony Pictures Classics. Bookmark the permalink.